Birds which have been domesticated, such as the domestic chicken and duck, have lost the ability to fly for extended periods. They are flightless birds. Sometimes you might, however, see them fly a few feet or maybe even a couple of dozen feet. But their original ancestral species, the red junglefowl and mallard, respectively, are capable of extended flight. Some bred birds, such as the Broad Breasted White turkey, have become totally flightless. That’s because of selective breeding. Those birds were bred to grow massive breast meat. But the weight resulting from that is too much for the bird’s wings to support in flight. As a result of selective breeding; a few selective bred birds have become totally flightless. Losing their ability to fly, flightlessness, has evolved in many different birds independently. Below is a small sample of eight flightless birds. Have you seen any of these birds? Birds that fly have different wing and feather structures.They help make flying easier. However, flightless birds‘ wing structures are well adapted to their environment and activities. One of those commonly seen activities of birds around water is diving in the ocean. There are some bird species that appear to be in the process of losing their powers of flight to various extents. Some of these are the Okinawa rail of Japan, the Zapata rail of Cuba, and the Laysan duck of Hawaii. All of these birds show adaptations which are common to flightlessness. Such adaptations evolved recently from flying ancestors. Those birds, however, have not yet fully given up the use of their wings. But they are weak fliers and are incapable of traveling long distances by air. Penguins are a group of flightless, aquatic birds. They live almost exclusively in the Southern Hemisphere. 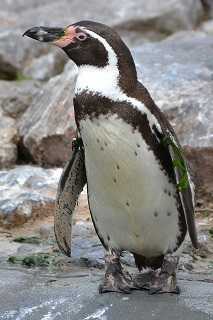 However one species, the Galapagos penguin is found north of the equator. Penguins are highly adapted for life in the water. Their wings have evolved into flippers. Most penguins feed on krill, fish, squid and other forms of sea life. In order to get their food they usually catch their meal while swimming underwater. Penguins spend about half their lives on land and the other half in the sea. More information on flightless birds can be found on Wikipedia and other sources.